Raina’s first graphic novel, SMILE, is one of the most popular books in my classroom library. I have had two copies fall apart from being read so many times. When I saw her speak at the National Book Festival in DC two years ago, she did an amazing job of connecting with the audience and even invited some of the younger ones to help her in creating a comic on the stage. An all-around A+ person! The main character is a girl who is trying to find her place in school. In this case, Callie is a member of the drama production team at her school, helping out with set design. Her issues are the everyday issues that teens run into. She’s got a crush on a guy who already has a girlfriend. Her little brother is annoying. The drama budget doesn’t allow her to make the stage props she dreams of making. She’s wondering if someone will ask her to go to the school dance. The art is clean, colorful, and clearly emotive. At its heart, DRAMA is about a cast of young people learning about who they are. Cassie has her heart set on being a part of the arts. One of the boys she meets has realized that he likes other boys. It’s all about identity. 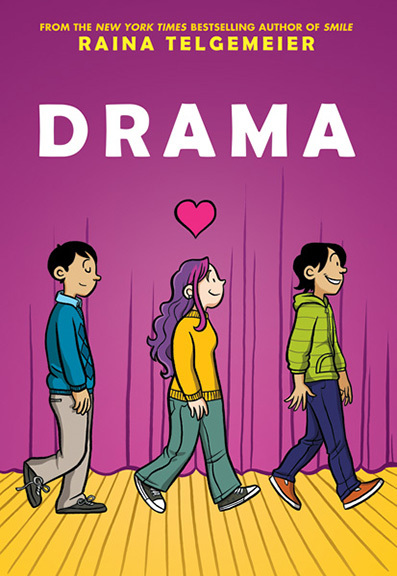 DRAMA is an all-around winner of a graphic novel. Add it to your shelves immediately.